When Greg Cantori and his wife, Renee, are ready to retire, they will not only have to pack up their respective offices, but also downsize their home, in a big way. 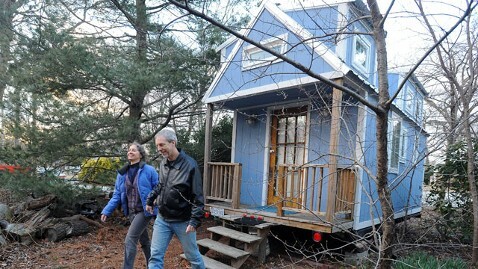 The Cantoris of Pasadena, Md., plan to retire in a 238-square-foot house on wheels they purchased two years ago for $19,000. The couple lives with one of their two grown daughters in a 1,400-square-foot, three-bedroom, two-bath home on the same lot where their future retirement home waits on wheels. “We don’t know how many years it will be but we’re getting there,” said Cantori, the president of Maryland Nonprofits. Cantori, 53, became used to living in small spaces as a 19-year-old living aboard a sailboat and then spent his honeymoon with Renee, 51, living aboard a 30-foot sailboat in the Virgin Islands for three weeks. “We know what it’s like to live small and simple,” Cantori told ABCNews.com. Once on dry land, the Cantoris raised two daughters, now 19 and 22, and began to follow the “tiny house” movement in which people, like themselves, choose to abandon space for simplicity and give up luxuries to make do with less. The Cantoris, however, can completely conceive of it and have made it their “goal” to live full-time in the “tiny house” they purchased from a lawyer in Kansas and drove across the country to Maryland attached to a U-Haul. Their “tiny house,” which consists of a kitchen, bathroom, living space and two bedroom loft, has stayed put on their property since its purchase, but once retirement comes, the Cantoris plan to move on. “The rigidity people haven when thinking of their lifestyles, they don’t realize they have many other options,” he said in response to those who wonder how, or why, the couple would choose to downsize in such a drastic way. “None of this is permanent,” Cantori said. Cantori also sees adapting to a “tiny house” as a great and easy way to keep the property in the family. Both daughters, according to their father, “love” the house and their parents’ retirement plans. This story was originally published here and is the property of ABC News.